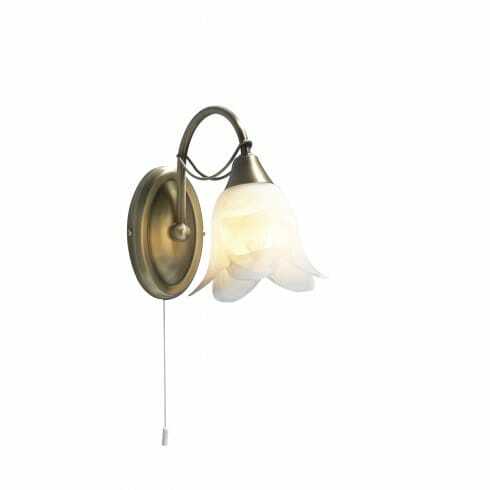 Dar Lighting Doublet single light wall fitting displays a wealth of time-honoured style that remains as popular today as ever. It features a curving, stem-like arm supported by a circular ceiling plate and topped with a beautiful flower shaped alabaster glass shade. The antique brass finish gives the fixture an elegant, aged appearance that compliments the traditional look. The product code for this Dar wall fitting is DOU0775. A classic, design that would add a wonderful brightness to conventional and contemporary homes alike. Comes complete with a pull cord for ease of use. Please see our website for the entire Doublet range which includes 3 and 5 light ceiling fittings, and a 2 light wall fixture. All of these items are also available in an a shiny, polished brass finish and are available to order from our website.